The public smoke session, accompanied musically by the reggae band playing next door at The Goose bar, likely represented the largest public smoke-out in Boulder this 4/20. On the University of Colorado’s Norlin Quad meanwhile, the site of previous 4/20 smoke-outs that had drawn as many as 10,000 people in years past, not a single joint was lit this year. Security crews brought in to close off the campus reported no problems. Dozens of law enforcement officers had converged on the Norlin Quad Saturday afternoon, using yellow tape to close off the grassy area that in past years staged an unsanctioned 4/20 toking. This is the second year that CU has shut down the campus to the public and entirely closed off Norlin Quad – and officials said Saturday’s observance was the quietest 4/20 in years. The closure this year was a continuation of the school’s efforts to end the pot smoke-out entirely. “Right now, things are going really well,” said CU-Boulder spokesman Bronson Hilliard at an early afternoon press conference briefing. The quad was empty much of the day – except for a buffalo made out of snow that was melting fast in the springtime sun. 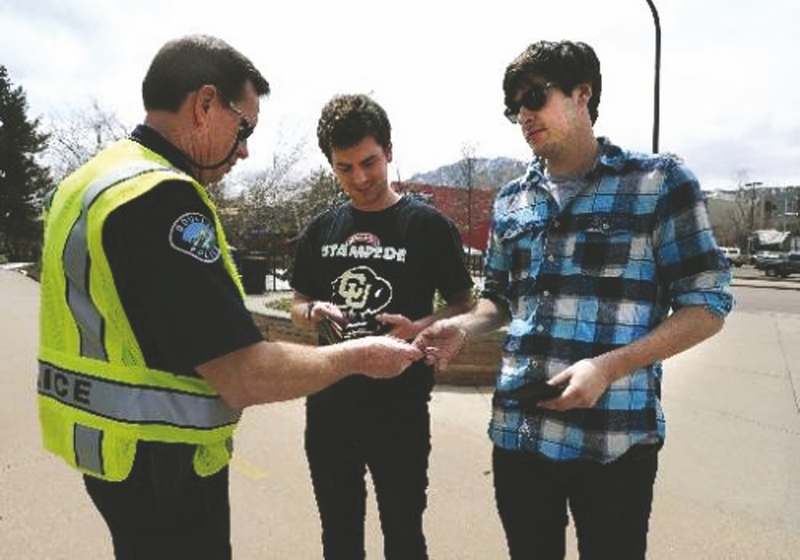 As of 3 p.m., CU officials reported that not a single ticket had been issued for trespassing or marijuana related offenses. “People are coming about, doing their business. Some are studying; some are participating in other events here on campus,” said campus police spokesman Ryan Huff. Huff said security staff around the campus reported only positive interactions with students and other people at the various checkpoints. One new addition to the closure protocol this year was small yellow cards being handed out upon request to provide reasons for, and the details behind, the closure. The cards also provide an outlet for people to express their opinions about the 4/20 campus closure. People are invited to email 420feedback@colorado.edu with questions, comments and concerns, Huff said. But as early as 6 a.m. Saturday, campus security officers were warning dog walkers and joggers about the campus being closed to the public. Signs were posted throughout the campus warning of the closure. Those who violate the closure can be arrested on trespassing charges, a misdemeanor that carries up to a $750 fine and six months in jail. Some were a bit surprised when they were approached by a security guard asking if they had campus identifications. He starts at Macky Auditorium and circles the campus near the Kittredge dorm complex. A few years ago, at the height of 4/20, he said he let some students park in his driveway at his house on University Hill. The administration last year spent $124,561 and the CU Student Government, which put on a concert featuring Wyclef Jean, spent $154,236. The concern, designed to draw students away from Norlin, was poorly attended, attracting just a few hundred students. Student leaders this year decided against staging a similar event. The university pays for 4/20 enforcement with insurance premium rebates that result from the school’s reductions in liability and hazard claims, officials said. Unlike last year, the university this year did not apply a fishy-smelling fertilizer on Norlin Quad — which saved the campus $700.